The impression clients have of a salon or spa starts at the reception desk. This vital frontline position is the command center for the business and should be managed by someone who is highly attentive and detail-oriented. You want them to be friendly and sincere, with an innate talent for customer service all while watching out for the welfare of the salon or spa and its staff. Whether you are running the front desk or hiring someone who will, these tips will keep your salon or spa humming along while offering the best possible experience for your clientele. Instead of seeing the reception position as a greeter or gateway into the salon or spa, see it as an opportunity to be a salon or spa concierge. You know, the friendly person you usually see at a high-end hotel. The one who greets you by name, who knows how long your stay will be and who has a list of restaurants and activities chosen just for you. They are always there in the lobby at the ready to make your stay an enjoyable one and seem to know what you want or need before you do. Why not use this same way of thinking in your salon or spa? After all, this is a service industry, and people come to your establishment expecting to be pampered. The minute your door opens, the client should be met with a smile and a friendly hello, if possible by name. At check-in, confirm who they have come to see and invite them to take a seat while you notify the operator. Offer the waiting client a beverage, point out where they can find reading material and let them know how long it will be before someone comes to get them for their appointment. At check-out, ask how the client liked their service and if there is anything else they may need for at-home hair or skin maintenance. Make suggestions based on their services or past retail purchases. Process their payment and then check to make sure that their next appointment is scheduled. If not, ask if you can schedule it for them. Before the client leaves, thank them for coming in and wish them a good day, afternoon or evening – whatever’s appropriate. Regardless, stay focused on the client the entire time of the checkout process, so they know that they are important to you and the whole salon or spa staff. Clients like to feel special and appreciated, so, pay careful attention to everything about them. Know a little bit about their families, what each client does for a living, maybe even a few interests. Make notes on their client files so that it’s easy to reference on later visits. If appropriate and to your liking, complement their new hairstyle, notice the subtle change in their hair color, the smoothness of their skin after a facial or even the tan from their recent island getaway. Because the reception area is central to the salon or spa operations, clients look to receptionists for a fair amount of knowledge. That knowledge starts with a familiarity of all services the salon or spa offers, the strengths and specialties of each service provider, and a solid understanding of the products and tools available for retail. To gain this knowledge, try to experience each service, if not witness the process and the result, so you can speak intelligently about it to others. Know pricing or at least have easy access to it and get to know each operator and their work so that strengths and specialties are easily identified. Also, sit in on as many product knowledge classes as possible as there is a wealth of knowledge taught by a representative of the brand, as they have much to offer you. If nothing else, cruise through product catalogs or the brands’ online presence to get to know what to use on what type of hair or skin and for what desired result. For each day, know the schedule and stay on top of how things are operating. Be aware of when a client is running late or a possible no-show. In that case, inform the operator and take the initiative to make contact with the client to see if they are still coming or if they want to reschedule. If a service operator is running behind, let the client know when they arrive. Clients are far less likely to get upset about a delay if they are informed at check-in. There are many ways that technology can help streamline the salon or spa concierge duties. Sending a text to a stylist or facialist when a client has checked in or is running late, using salon management software to access client information, make product recommendations, and schedule appointments. Even use facility cameras to monitor the status of treatments and services, and to gauge when a client is ready to check out. Stay calm and unscathed during rushes but make good use of your downtime to tidy up, make coffee, straighten up the waiting area, put away magazines, remove trash, and even restock retail shelves when things are slow. Also look into retail, back bar, and dispensary inventory so orders can be made as needed. But when things get overly busy, know when to ask for help. There are times that you’ll need a manager or the owner to step in to take care of an unruly customer or an assistant to help out during rushes. When the phone is ringing off the hook, and there’s a line to check in and out, get help right away. Work out a plan with the rest of the staff, so they know when to step up and help at reception, hopefully without having to be asked. 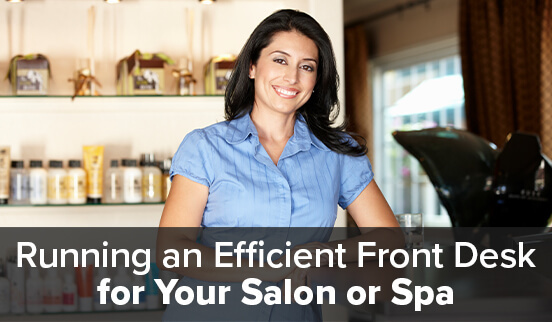 Just like your salon or spa operator counterparts, put some time and effort into your continuing education. There are always better ways to do things in a business and more opportunities to make the client experience that much more memorable. I enjoyed reading about your software. Could you give me an approximate time frame for conversion and if you handle transferring of information at set-up. Awesome to hear that you have enjoyed the information so far. It would all depend on which software you would be coming from. Typically conversion takes 24-48 business hours. If you get into contact with an account manager or someone from support they would be able to further assist you with your questions. 877-346-7679 Ext 2. We look forward in hearing from you.